Find Great Hires, Fast With Monster. Need help? Contact us at 1-800-MONSTER. Enterprise customers: Please contact us at 1-800-MONSTER for pricing on a custom solution. A Reusable Job Slot is the ability to advertise your job on Monster.com on an ongoing basis. You can rotate, pause, and restart your job slot, to align to your hiring needs and candidate flow. • Week 1 — You post a job for an accountant. • Week 3 — There’s an urgent need for a customer service rep. You take down the accountant job and post a job for a customer service rep.
• Week 6 — The customer service rep is hired so you take down that job and repost the accountant job. Our responsive website delivers the best user experience, regardless of device. Your job slots will automatically appear on Monster.com, 500+ newspaper sites, our mobile apps, and Monster’s network of sites. Candidates receive email alerts about your jobs, based on their preferences. We don’t limit the number of candidate resumes you can receive during the period of time your job is posted. You can continue to receive resumes for as long as your job ad runs. You’ll receive notifications regarding candidates that match your job requirements. 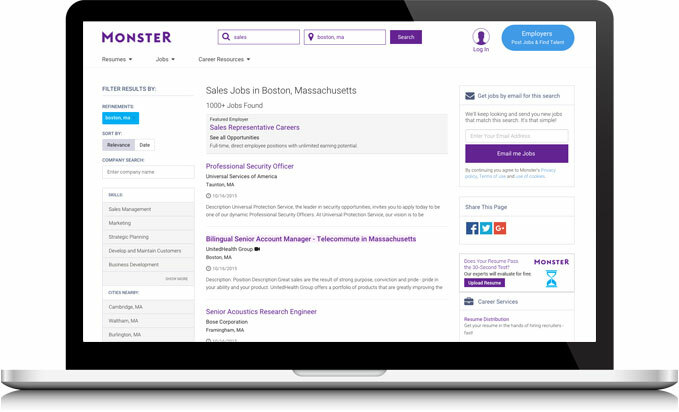 View hundreds of job descriptions in our Resource Center http://hiring.monster.com/hr/hr-best-practices/recruiting-hiring-advice/job-descriptions.aspx. * The minimum commitment is 90 days for a Monthly Plan and 12 months for an Annual Plan. *The minimum commitment is 90 days for a Monthly Plan and 12 months for an Annual Plan. Job Slots get your jobs in front of the right audience, and attract top talent. Week 1 — You post a job for an accountant. Week 3 — There’s an urgent need for a customer service rep. You take down the accountant job and post a job for a customer service rep.
Week 6 — The customer service rep is hired so you take down that job and repost the accountant job. Reusable Job Slots in Your Plan: The number of Reusable Job Slots included in your plan, is the maximum number of jobs you can have posted simultaneously. Greater Exposure: Your job slots will automatically appear on Monster.com, 500+ newspaper sites, our mobile apps, and Monster’s network of sites. Not ready for a Value Plan? Purchase a single job ad. The free trial includes 1 Job Slot that can be used for 3-days. You may cancel at any time during the 3-day trial, in order to avoid charges for continuing the service. If you do not cancel, you will be converted into your selected Value Plan upon completion of the free trial. Monthly Value Plans can be cancelled at anytime via a link available online in Customer’s Account Preferences. Cancelling the Value Plan will discontinue the automated charge for the next billing cycle. You will be able to continue using your purchased products if there are remaining days on the current 30-day cycle. How do Reusable Job Slots work? We recommend against frequent rotation of jobs within the 30 days, as this may not allow enough time for a sufficient number of candidate responses. Yes, you can! Try our free 3 day trial which allows you to post a job on Monster using a Job Slot for 3-days, with no obligation. Select a plan to start the free 3-day job. The maximum number of initial email messages, that can be sent to candidates from Talent CRM. Candidate replies and your responses back, are unlimited. You can start a Live Chat here, or give us a call at 1-800-666-7837.